Belvedere is an island a mile long and less than one half mile wide, connected to Tiburon by a causeway. 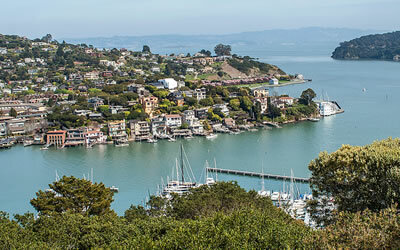 Perched atop the tiny island in Richardson Bay, Belvedere, which translates in Italian to “beautiful view,” enjoys fantastic vistas of San Francisco Bay, Angel Island, and the Golden Gate Bridge. Once a fishing community, the town is now well known for its sailboats, and a host of vessels moored at the docks outside one of the two yacht clubs nearby. 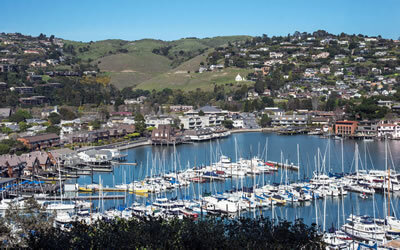 Although it is the smallest incorporated community in Marin, it is also one of Marin’s most exclusive, boasting some of the most expensive homes in the county. A treasure trove of architectural styles, Belvedere homes range from Queen Anne and Mission Revival homes of the late 1880s to more modern houses and Mediterranean villas. Elaborate gardens complement these stately homes and large setbacks lend a secluded feel to the heavily wooded town. 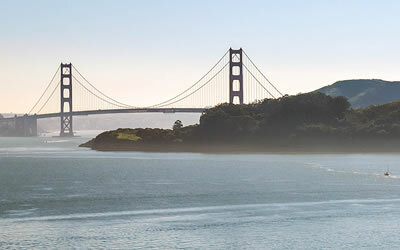 Belvedere does not allow shops or restaurants on the island, but a short bridge brings residents to the town of Tiburon where one can shop and dine. In addition, the residents enjoy a short commute to The City either by high-speed ferry or on Highway 101.